Vordio | Audio post production workflow reimagined. Building tools for faster sound editing. 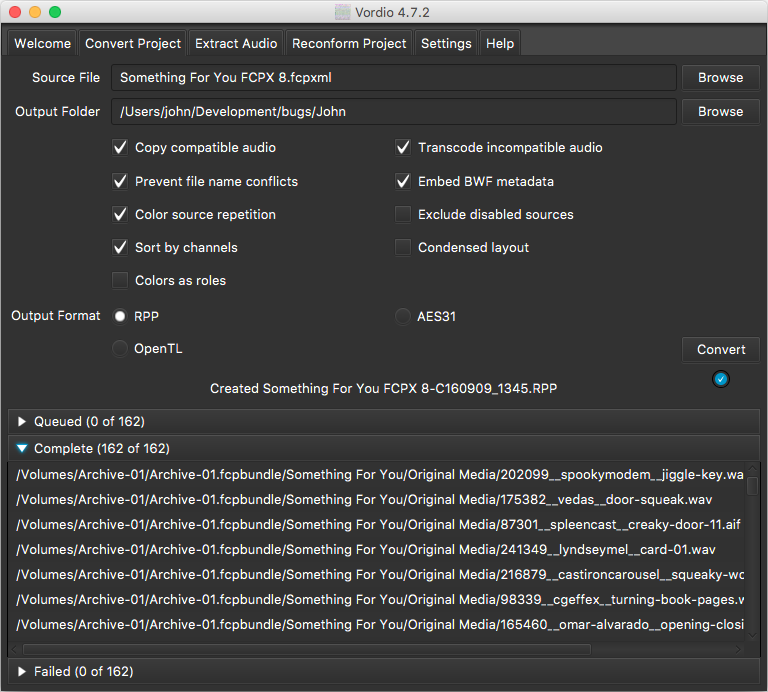 Vordio is an audio post production workflow tool that converts XML exported from an NLE video project into a REAPER audio project for audio post production. It has a powerful reconform feature that allows the vision and sound editors to work in parallel easily without the need for picture lock. If you are not familiar with REAPER, read why the flexibility of REAPER makes it a good first choice for sound editing. It includes a few video tutorials to get you started. You can download Vordio for free here. You can upgrade it later by installing an additional license file. The free version has a 3 minute timeline length limit for the translated project file, but all media for the whole project will still be transcoded/copied. This means the free version can be used by a picture editor to pack up the media to send to a sound editor. You only need a license at the receiving end to regenerate the full timeline if longer than 3 minutes. For most functions, the interface is pretty simple. So to convert a project, just drag and drop an XML file. The default options should work fine for most cases. They are set up to produce a self contained REAPER project. For XML from FCPX, audio items are arranged based on their role (music, dialogue, effects etc) and their audio configs. 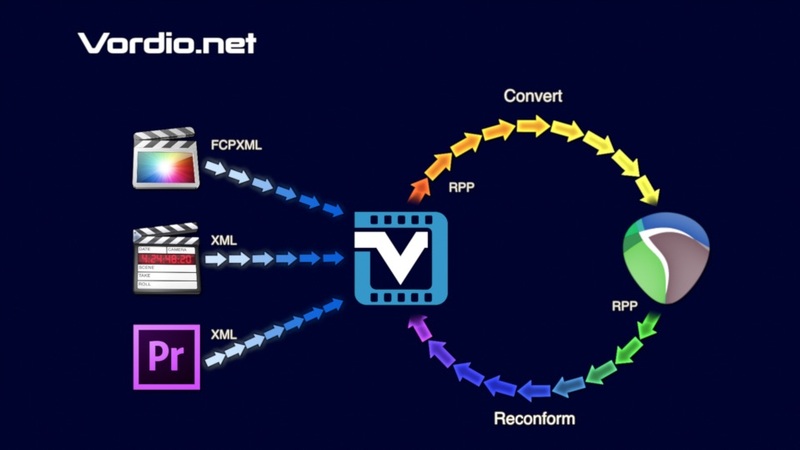 For XML from Premiere they are arranged by clip colour which can be used similar to roles in FCPX. Audio items are coloured based on the media file they relate to. This makes it easy to spot takes that have similar audio issues and also find repetition in the edit that may need to be addressed. Useful information such as scene/take, markers & regions are shown in the audio item notes or project time ruler. Reconformed REAPER project with an extra scene added in the middle. The changes have been colour coded. Blue means unchanged, Green means moved, Orange means newly added audio that wasn’t in the previous version of the edit.